This Decadent 10-Minute Garlic Butter Baked Lobster Tails Recipe is ready in just 10 minutes with minimal ingredients. 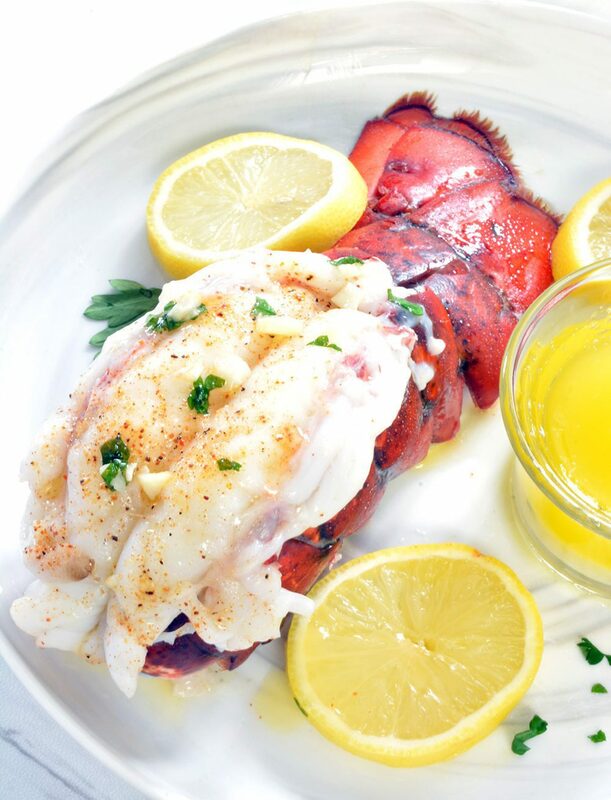 Get restaurant quality baked lobster tails, drenched in butter and garlic, at half the price. Making soft, juicy, buttery lobster tails at home is shockingly simple. Gone are the days where you’re left with rubbery lobster. With a few simple ingredients and just 10-minutes, you can have perfect lobster tails prime for dipping in rich butter sauce. When making these baked lobster tails, keep in mind you do not have to butterfly the meat if you prefer not to. You can always cut a long rectangular area out of the shell to expose the meat if you prefer. Should I Use Fresh or Frozen Lobster Tails? The answer to this question depends on where you live and your shopping habits. When I lived in landlocked Austin it was hard to find high quality fresh seafood compared to San Diego, where we have fresh seafood year round. So even though fresh is the best option, frozen lobster tails is usually my go-to. This lobster tail recipe will make frozen tails taste fresh, so no worries if you can’t find fresh tails to work with. Frozen lobster tails get cooked the same as fresh tails. All you need to do is thaw them overnight in the refrigerator. Don’t have time? Place them in a pot filled with cold water for 30 minutes. Do not under any circumstances use a microwave or hot water. Just don’t. How Much Are Lobster Tails? 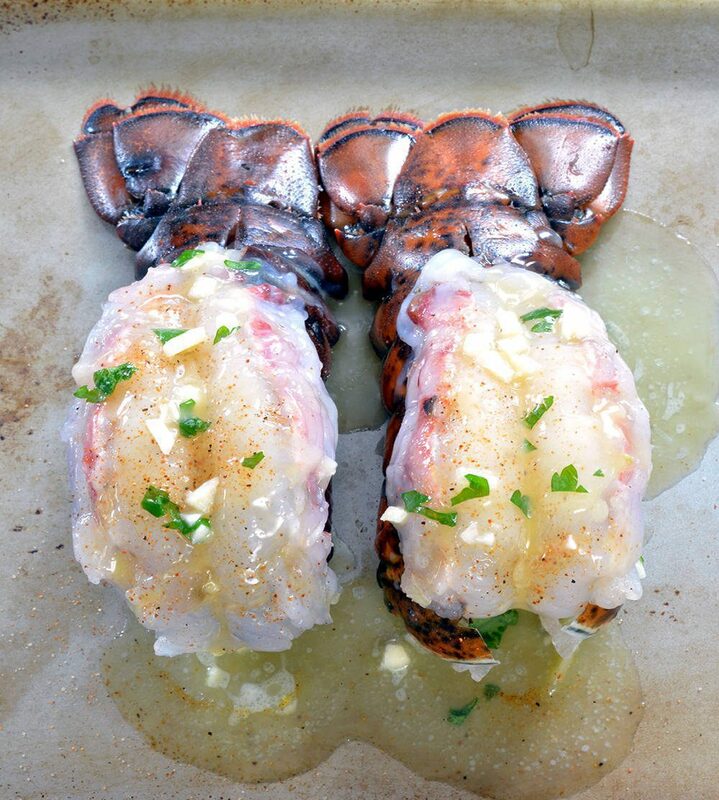 Lobster tails can be quite inexpensive to make this time of year. You can easily find a 5-6 oz tail for only $5 leading up to Valentine’s Day and through out the year. Costco usually carries them for about $6 each, however you need to buy in multiples of four. Just avoid the fancy markets – those run up to $30 per tail. Hard pass. Place the lobster tail on a cutting board with the shell facing up and the tail facing away from you. Make a snip down the center of the shell until you reach the base of the tail. Flip the tail over and, using your thumbs, press firmly in the center of the lobster to crack the ribs. You will hear a snapping sound as you press down. Flip the tail back over and remove the vein (if one is present). Carefully glide your thumbs or index fingers under the meat to detach it from the shell. Once detached, carefully lift the meat from the shell (keeping the base attached). Press the spread shell together and set the lobster over the top. A few tips to baking lobster tails. Cut the tails using a very sharp kitchen knife. Dull knifes will break the shell. Who wants to pick out broken shells before cooking? Before pre-heating the oven, move the rack to the top slot if your lobster tails are under 7 oz. If the tails are over 7 oz, move the rack to the center slot. Cooking times do vary based on the size of your lobster tail. Even with this guidelines you should watch the oven closely to avoid burning. Broil lobster meat until 140 – 145˚F. It should be opaque and white in the center while the shell is bright red. The meat should be firm to the touch. What To Serve Lobster Tails With? You mean other than drawn butter? How about drawn butter flavored with minced garlic or Old Bay seasonings? Butter laced with freshly chopped thyme, dill, tarragon or a sprinkle of paprika. A squeeze of lemon? These are numerous flavors you can add to butter to pair your broiled lobster with. Experiment until you find your favorite pairing. Put butter and minced garlic in a small microwavable bowl and microwave about 30 seconds until melted. Using a small spoon, drizzle evenly over the exposed lobster meat. Squeeze a slice of lemon over each tail. Sprinkle with a pinch of cajun seasonings or sea salt (one or the other - not both). Remove and serve immediately with drawn butter and lemon slices. *Prefer not to butterfly the meat? Just cut a long rectangular area out of the shell to expose the meat. Broil lobster meat until 140 - 145˚F. It should be opaque and white in the center while the shell is bright red. The meat should be firm to the touch.